...So as an anniversary gift to ourselves, we designed an eau de parfum for this fantasy street that was filled to the brim with perfume wearers. We envisioned it not in any particular part of town—instead, it partakes of the best of all of New York: the elegance of the Upper East Side, the culturati atmosphere of the Upper West, the high-voltage energy of Midtown, the bohemian verve of Downtown and the Manhattan-ized parts of Brooklyn, and the lively dynamism of the outer boroughs. This imaginary thoroughfare, which we named Perfumista Avenue, hovers all around town. [...] There are many who say that the template for exquisitely beautiful and accomplished women was set in New York. But Perfumista Avenue was made for women everywhere who exhibit a New York state of mind. 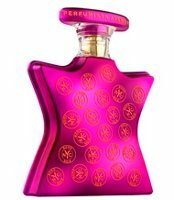 Super-strong and determined, this is an orientalist, leather-tinged blend that modernizes the breathtakingly fresh, ultra-feminine rose (New York State’s official flower). Here, rose is immediately perceived as a starting point, accompanied by lush and succulent plum. These give way to a series of overtly seductive animal notes: honey and musk, along with musk-like amber, and earthy patchouli. The overall effect is high-grade intoxication. Additional notes include davana, nutmeg, safran, peonies, jasmine and mate. Bond no. 9 Perfumista Avenue is available in 50 ($260) or 100 ($340) ml Eau de Parfum. Are they competing with Victoria’s Secret for the most number of fragrance realeases???? It’s impressive — 68 scents so far. I would have to count, but guess VS still wins! I am not impressed with this line, those that I have smelled. Plus, I find their bottles, packaging just kind of overall irritating. I really like a few of them. Also admit I have fallen WAY behind, so I know there are many I don’t like, but no longer have a sense of what the line is up to these days. It actually smelled quite nice when I tried it a month ago but since I’m boycotting the Bond no.9 that perfume will be never again an object of my interest. Can I ask why you’re boycotting Bond? I personally don’t like any of their scents, something about them always smell off on me. Yet another Bond no. 9 I can’t afford. Yay. Ack, they almost had me….until the word “honey”. Cannot stand whatever molecules they use to create that in perfume; it actually makes me instantly nauseated. Plus they don’t need my money that bad if they have funds to waste on stupid scare-tactic lawsuits.